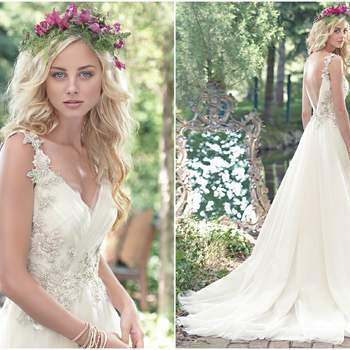 Vestidos de novia Maggie Sottero 2016: ¡Te cautivarán! 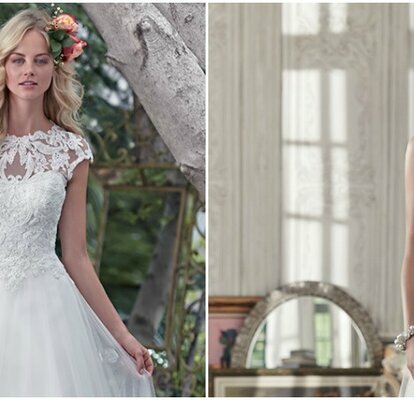 En esta colección de vestidos de novia Maggie Sottero podrás encontrar el vestido de novia perfecto para ti, con diseños y estilos únicos. ¡Míralos y déjate cautivar por ellos! En el momento en que comenzamos a pensar en nuestro matrimonio, lo primero que se nos viene a la mente es en qué vestido de novia es el que vamos a usar. Existen infinidad de estilos y cortes como el corte princesa, el corte sirena o los vestidos con espalda al aire, además de las diferentes firmas de diseño nupcial que día a día nos presentan diferentes opciones. 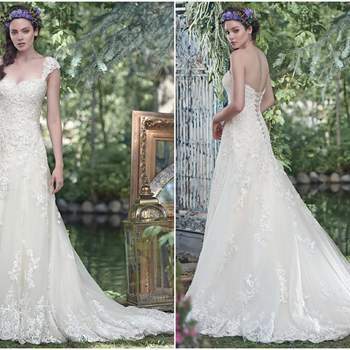 Por eso, para ayudarte con la elección es que te queremos mostrar la próxima colección de los vestidos de novia Maggie Sottero para 2016. Esta colección va a encantarte pues, como podrás ver, sus diseños se caracterizan por la alta calidad en sus tejidos como la seda, los encajes y el satén. Cada vestido tiene infinidad de detalles llenos de bordados e incrustaciones de Swarovski, dándole elegancia y haciendo de estos vestidos de novia una prenda única. Y si eres una novia joven, esta colección de vestidos de novia Maggie Sottero también es para ti, pues encontrarás modelos perfectos que se adaptarán a tu figura y a tu personalidad. 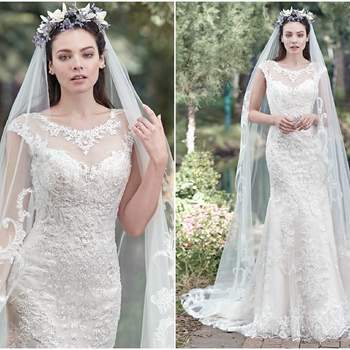 En conclusión, en esta colección de vestidos de novia Maggie Sottero podrás encontrar el vestido de novia perfecto para ti, con diseños y estilos únicos que te cautivarán haciéndote elegir uno de estos para tu gran día. ¡Míralos y déjate cautivar por ellos! Aracella. Elegant glamour is found in this stunning ball gown, featuring a voluminous tulle skirt, romantic sweetheart neckline, and lace bodice, accented with metallic embroidery and glittering Swarovski crystals. Finished with pearl buttons over zipper and inner corset closure. Cadence. Elegant and timeless, this fit and flare wedding dress features embroidered lace on tulle and a romantic, scalloped lace sweetheart neckline, creating a show-stopping silhouette. Finished with corset closure. Kirstie. 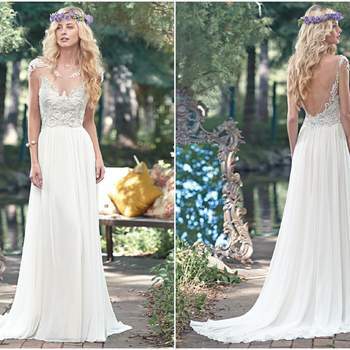 Elegant lace appliqués drift atop tulle to create this breathtaking bohemian sheath wedding dress, with a timeless, romantic sweetheart neckline. Finished with covered buttons over zipper and inner corset closure. Lansing. Exquisite lace hugs the bodice of this romantic fit and flare wedding dress, before falling into a dramatic tulle skirt, edged in delicate lace. Finished with sweetheart neckline and corset closure. Mercedes. Elaborate patterned lace adorns this breathtaking tulle fit and flare wedding dress, complete with stunning illusion sweetheart neckline and illusion back. Finished with covered button over zipper closure. Tulle veil sold separately. Montgomery. A delicate illusion off-the-shoulder neckline coupled with a dramatic illusion lace back create glamour in this alluring ball gown wedding dress with delicate lace bodice and flowing tulle skirt, accented with a feminine Swarovski crystal belt. Finished with crystal button over zipper closure. Morgan. Glimmering lace appliqués, dotted with Swarovski crystal and pearl embellishments, lay atop tulle in this alluring ball gown, with stunning illusion sweetheart neckline and illusion back. 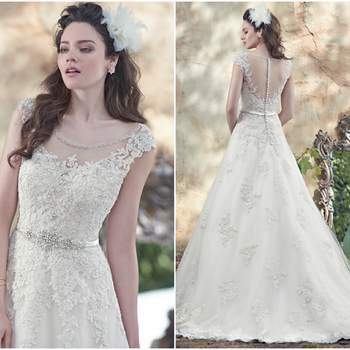 Dainty lace cap-sleeves and a delicate ribbon belt at the waist complete the look. Finished with covered buttons over zipper and inner elastic closure. Narelle. Rich, structured Yaron mikado creates this classic ball gown wedding dress with hidden pockets and a subtle scoop neckline and drop waist edged in sparkling Swarovski crystals. Finished with corset closure or crystal buttons over zipper and inner corset closure. Poppy. Romantic lace and a soft Vicenza organza combine to create this timeless A-line wedding dress, with sweetheart neckline and wide Soft Shimmer satin belt, glittering with Swarovski crystals, at the waist. Finished with half corset and half zipper closure. Radella. The perfect combination of vintage and glamour is found in this tulle with lace appliqués fit and flare wedding dress, adorned with intricate patterns of glittering Swarovski crystals and opalescent pearls. 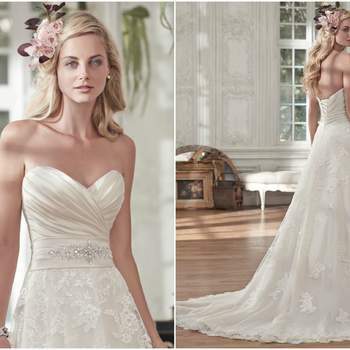 A dramatic sweetheart neckline completes the look. Finished with covered buttons over zipper and inner corset closure. Detachable tulle capelet sold separately. Chandler. A stunning illusion lace neckline takes center stage in this ball gown wedding dress, with enchanting lace bodice and flowing tulle skirt. A breathtaking illusion lace keyhole back adds a dose of drama. Finished with dainty cap-sleeves and zipper closure. Rosamund. Lovely in lace, this fit and flare wedding dress is the epitome of beauty with bold lace appliqués laying atop tulle, cascading to a subtly flared skirt. Finished with sweetheart neckline and corset closure. Detachable lace cap-sleeves sold separately. Saxton. This elegant Gossamer chiffon sheath gown is sweetened with a ruched bodice, accented with a Swarovski crystal and pearl embellishment. Finished with crystal cold-shoulder sleeve, plunging V-back and crystal buttons over zipper closure. Detachable Gossamer chiffon Watteau train offered separately. Storm. 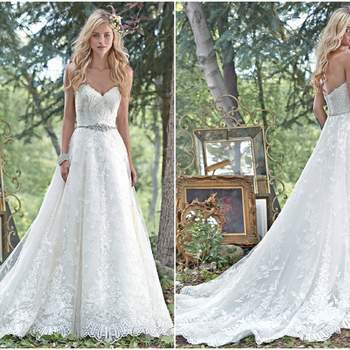 A gorgeous fitted lace bodice, dotted with sparkling beading, hugs the body of this fit and flare wedding dress, with a voluminous, layered tulle skirt. Finished with romantic sweetheart neckline and corset closure. Tami. A stunning illusion back and feminine illusion sweetheart neckline, edged in floral lace appliqués, takes center stage in this Vogue satin A-line slip dress with lace and tulle overlay. Finished with covered buttons over zipper closure. Laverna. Glittering lace appliqués, sweetened with Swarovski crystals, drape the bodice of this elegant tulle A-line wedding dress, with an exquisite lace-lined hem. Finished with sweetheart neckline and corset closure. Detachable lace cap-sleeves sold separately. Luna. Dreamy lace and tulle combine to create this elegant ball gown wedding dress, with a romantic sweetheart neckline, and delicate Swarovski crystal belt accenting the waist. Finished with crystal buttons over zipper and inner corset closure. Magde. Decadent and indulgent, this A-line wedding dress is draped in rich Marquice organza, creating a gorgeous pleated bodice and a flowing skirt. Lace appliqués, dotted with shimmering sequins, accents the hip. Finished with covered button over zipper and inner elastic closure. Malina. Understated drama is found in this fit and flare wedding dress with a stunning fitted lace bodice, accented with Swarovski crystals, and voluminous tiers of tulle and Chic organza layered throughout the skirt. Finished with sweetheart neckline and inner corset and covered buttons over zipper closure. Beaded lace keyhole coverlet sold separately. Patience. Comprised of barely-there tulle, this stunning sheath wedding gown sparkles with a delicate Swarovski crystal belt at the waist. A flattering ruched bodice with feminine lace neckline and cap-sleeves is finished with crystal buttons over zipper and inner corset closure. Geddes. Floral lace appliqués, dotted with shimmering sequins, adorn the bodice of this tulle sheath wedding dress, with deep V-neckline and stunning, deep V-back. Finished with covered buttons over zipper closure. Kamiya. Timeless and elegant, this romantic lace and tulle A-line wedding dress features a stunning L'Amour satin pleated bodice and lightweight lace and tulle skirt, accented with a delicate Swarovski crystal embellishment at the waist. Finished with half corset and half zipper closure. Miranda. 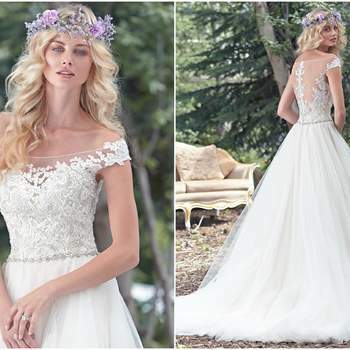 Gorgeous lace and tulle combine to create this stunning fit and flare wedding dress, accented with shimmering beads and a classic sweetheart neckline. Finished with covered buttons over zipper and inner elastic closure. Misty. Glamorous Swarovski crystals and pearl embellishments adorn the scoop neckline of this ball gown wedding dress, with a gorgeous ruched tulle bodice and voluminous tulle skirt. A feminine Swarovski crystal belt accents the waist. Finished with crystal buttons over zipper and inner corset closure. Amal. The perfect blend of vintage glamour is found in this elegant Vogue satin, slim A-line slip dress and tulle overlay, with linear patterns of decadent pearls and beading, and a dazzling illusion back. Finished with illusion short sleeves, V-neckline and crystal buttons over zipper closure. Jovi. 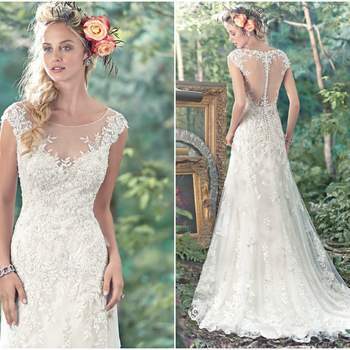 Embroidered lace appliqués adorn this stunning sheath wedding dress, with a breathtaking illusion lace back. Finished with illusion sweetheart neckline and pearl buttons over zipper closure. Detachable train sold separately. Kalisti. "Romance is found in this stunning tulle sheath dress with plunging neckline and sparkling Swarovski crystal embellishment at the waist. Intricate patterns of beaded embroidery dance along the shoulder and lead to a dramatic illusion back. Finished with crystal button over zipper closure. Detachable tulle Watteau train sold separately. " Landonna. Elegant and sophisticated, this A-line wedding dress combines a decadent, Swarovski crystal beaded lace bodice with an ethereal Chic organza and tulle skirt, perfect for the truly romantic bride. Finished with sweetheart neckline and corset closure. Detachable beaded lace cap-sleeves sold separately. Marina. Dalila chiffon creates the breathtaking skirt of this sheath wedding dress, featuring a glittering Swarovski crystal and opalescent pearl bodice, stunning illusion bateau neckline and delicate cap-sleeves. Finished with dramatic, plunging back and crystal buttons over zipper closure. Romyn. Demure illusion tulle, sprinkled with lace appliqués and sparkling Swarovski crystals, adorns the bodice of this fit and flare wedding dress, cascading into a soft, flared skirt. Swarovski crystals on illusion tulle dust the shoulders and trace a plunging illusion back. Finished with crystal buttons over zipper closure. Shelby. Beautifully detailed with embroidered lace and delicate pleated tulle, the fitted bodice of this romantic A-line cascades into a flowing tulle skirt, adorned with Swarovski crystals and floral inspired lace appliqués at the waist and shoulders. Finished with plunging V-neckline, back and zipper closure.